From Lynne: Patti, from Worth the Whisk, has been so kind to do this guest post and help my fledgling blog get off the ground. Her blog is so interesting and is filled with great recipes. Patti is also the creator of Camp Blogaway, a bootcamp for food and recipe bloggers, which is taking place May 14-16, 2010 in the Los Angeles area. 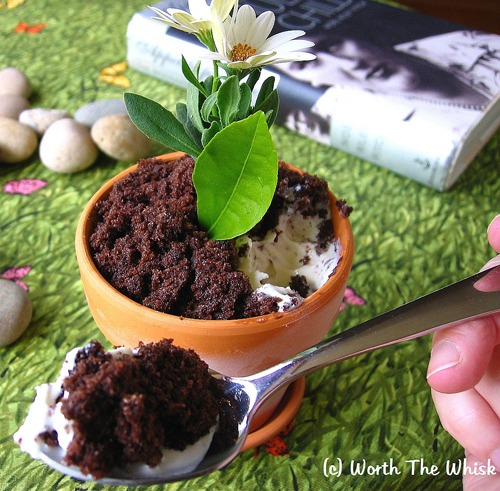 Hello to Lynne’s readers, I am Patti of Worth The Whisk and am guest blogging my all-time-most-visited post for Lynne… Flower Pot Ice Cream Sundae. Lynne and I have been getting to know each other better through our Los Angeles food blogger community. Last week, she was in the front row of my class, How to Become A Serious Food Blogger. Mentioning this funny recipe in my presentation was how Lynne and I ended up agreeing to guest post. Honestly, you cannot screw this up, it really isn’t a recipe, it is more like an edible craft project. For example, chunks of frozen frosting on my cake became corks for plugging the flower pot drain holes. I smashed up the rest of the cake for the “dirt.” Being as we are DINKs (Double Income, No Kids) I added a grownup splash of Kahlua to soften the ice cream. Larry, my taste-testing husband, thought the overall concept was weird, yet he still enjoyed his flower pot.